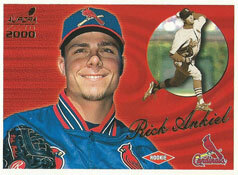 As a Cardinals rookie, Rick Ankiel struck out 11 batters in a game four times, twice doing it before his 21st birthday. _ Cardinals 7, Marlins 6, at St. Louis, May 25, 2000: Ankiel earned his fourth win of the season, striking out 11 in 6.2 innings. The effort was controversial because Ankiel threw 121 pitches. Scott Boras, Ankiel’s agent, said he believed the Cardinals had agreed to limit Ankiel to 100 pitches a game. _ Indians 3, Cardinals 2, at St. Louis, June 4, 2000: Six of the Indians’ first seven outs were on strikeouts. Ankiel struck out 11 in five innings and walked none, but was lifted after reaching 98 pitches. “I had a lot of strikeouts, but I really wasn’t going that well,” Ankiel said to the St. Louis Post-Dispatch. _ Cardinals 12, Astros 1, at Houston, July 21, 2000: Two days after turning 21, Ankiel struck out 11 in seven innings and improved his record to 7-5. Ankiel struck out Craig Biggio twice and Lance Berkman once. “He’s got an electric arm,” said Astros slugger Jeff Bagwell. _ Cardinals 9, Pirates 5, at Pittsburgh, Sept. 13, 2000: In the last game the Cardinals would play at Three Rivers Stadium before the Pirates moved into PNC Park, Ankiel struck out 11 in 6.2 innings, earning his ninth win of the season. Ankiel struck out the side (John Wehner, Mike Benjamin and Adrian Brown) in the second.